Bella Rocket Blender Review - Great Price But Does it Work ? Bella Rocket Blender Review – Great Price But Does it Work ? If you are looking for an inexpensive personal blender then the 12-piece Bella Rocket blender might be a good fit for you. The Bella 12 piece Rocket Blender is a very affordable entry level compact blender that is advertised as being able to blend smoothies, grind beans, puree soup, chop vegetables, and more. It has a 240 watt motor so it doesn’t compete with the popular Nutribullet / Nutri Ninja personal blenders but the Rocket blender can still work as a versatile kitchen appliance if you use the appropriate ingredients for that size of motor. The following are the main features, pro’s, and con’s to consider before deciding if the Bella Rocket Blender 13586 is right for you. The design of the Bella pocket blender is straightforward, all you need to do is attach the blending blades to a mixture cup and lock it in to start blending (similar to Nutribullet). It is very compact and easy to clean with dishwasher safe cups. It is very compact and can easily fit inside a kitchen cabinet for storage. It can do a good job for food prep like chopping and grinding so it could replace your coffee grinder and small food processor. In fact, the Bella Rocket has the same power of the popular Cuisinart Mini-prep food processor but the Bella Rocket is the half the price. 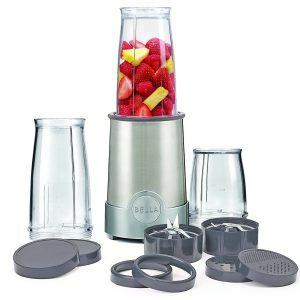 The Bella Rocket blender is a good option if you want a simple food prep blender to make something like salsa or dice up vegetables. For smoothies it can handle most non-frozen soft fruits, vegetables and grains. Even though the Rocket blender is marketed to be able to make nut butters I don’t think it would do an adequate job with a 240 watt motor and the portions would be small. Good Housekeeping tested the Bella Rocket and said it did well at grinding coffee beans and making simple single-serve smoothies but not intended for blending ice or frozen drinks. You would be better off paying up for the 600 watt or 900 watt Nutribullet blenders if you want to mill flours or make nut butters. A 240 Watt Blender base that comes in 8 colors. 1 stainless steel flat blade for milling and grinding. The main pro of the Bella blender is the price. It is hard to compete with its low price for the accessories it includes. You can do quite a bit with this blender if you just want to do small tasks and don’t need heavy blending capability. Cannot grind some hard foods or frozen ingredients. Some complaints of durability with the blade design. It is a limited 2 year warranty so no replacement parts are included in warranty. Should You Get the Bella Rocket Blender ? If you want a simple blender to make basic single-serve smoothie using soft ingredients. Want to make quick protein powder drinks. Need a portable blender to take on the go. Want a simple low-power blender to make your own puree baby food. Want a portable appliance to chop and grind. It is not very good if you want to make complicated smoothies with nuts or hard vegetables/fruits with seeds like blackberries. It can chop up nuts and coffee beans pretty well but it might not do it as well as specialized appliances. For the price, the Rocket blender is great. While it might not last forever, it should more than pay for itself if you use it properly. Remember it has a motor that is 1/4 the power of a Nutribullet Pro and 1/6 the power of a Vitamix so you need to have realistic exceptions in what the Rocket blender can do. For convenience and size, the Rocket blender 12 piece is worth the money for simple blending tasks.